Chic Alert: Miu Miu Wallet Giveaway! Win a gorgeous gift every day from now up until Christmas!!! Handbag.com are getting in the festive spirit and are giving you the chance to win a gift for yourself every day from now until Christmas Day. Gifts you could be unwrapping include designer handbags, jewellery and accessories,beauty goodies and foodie treats. 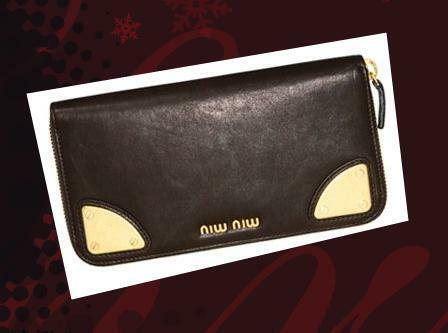 Today's great Christmas giveaway is this gorgeous Miu Miu Wallet valued at £140!! Don't you just love Miu Miu. Celebs like Demi Moore, Jessica Alba, Jessica Simpson and Mischa Barton do. Click HERE for your chance to win this perfect Christmas present!